When I started to look for a new sofa for our living room, one of my friends suggested the IKEA Ektorp sectional. She suggested it because SHE has it, and she knows I love it, but I answered with a “ha ha, right, it needs to fit in the van!” But then I googled, and I found a few posts that mentioned being able to fit the Ektorp into a minivan, (like here and here) but I found NO pictures of how that worked, and unlike just about every other product IKEA sells, the box dimensions are not listed on their website. So, when we went to IKEA today with fingers crossed, I vowed to take pictures and measurements so that other people would have this info if they googled. 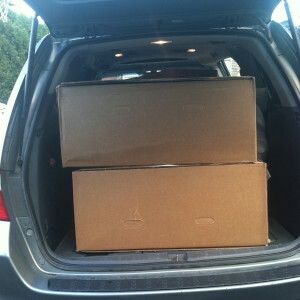 Here is how we fit the sofa into a 2005 Honda Odyssey, with all seats removed. It took us a couple tries to figure it out, so here’s the guide for those looking to do the same. I’ll start with the measurements. The Ektorp comes in four boxes. One is the cover, and that’s a small free-floating box, and the other three are shrink wrapped together. Pro tip: when you go to the sofa section of IKEA, you place your order there, but they don’t pull it til you pay. Once we’d paid, we had to wait about half an hour or so to have them fetch the thing, so if I were doing it again, I’d have placed the order, gone right down and paid, and THEN done my other shopping. Bring a box cutter or leatherman (or go back in and buy some sort of sharp object) and cut away all the shrink wrap. Be careful when you do it, because the way ours was loaded, dividing the load made each end go to the pavement. We also parked off to the side of the loading area, and I don’t know if that was cool or not but we were out of the way and no one made us move, and it worked much easier. Use the side sliding to put the corner piece in so that it’s 27″ side is the width, so set the square on its side. Load the two arm ends from the hatch, flat, one on top of the other. The hardest fit was behind the seats, because of the grab bars. We adjusted so the driver had more room, but the passenger seat was all the way forward and upright, which in an Ody isn’t terrible, but know that going in. We obviously had removed the center chairs, and hidden the 3rd row, before our trip. Things that make me crazy. Part I. Thanks for the measurements, this is EXACTLY what I was looking for!! Are you happy with your sectional? What color? Has it held up? We got red and love it! It’s only been 7 months and it’s holding up fine. I haven’t yet washed the covers or anything. Everyone who visits has commented on how comfortable it is. Thank you for this. I was just trying to figure out if we would be able to fit the sectional in my Toyota Sequoia. 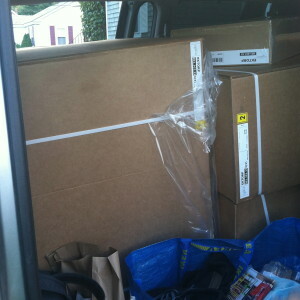 The IKEA could not get it to work here in the boxes, at least our box for the corner part was very large. When he untied everything and placed it how you said it was too large. However, the simple fix was to take the corner out of the box. Things fit just fine then and I was also able to fit the cover in the back as well then and I didn’t have to push the seats all the way up as well that way. 2007 odyssey. Ikea guy insisted on putting the corner piece in back/last. Still fit but had to put drivers seat all the way up to get back door closed because of height of back box. Not a comfortable drive home. Make sure you put corner piece in first as pictured. Thanks so much for this info!!! Do you still have the sectional? Wondering how it has held up after all this time. We are liking to get one tomorrow…..maybe. Can you tell me the dimensions of this sectional from the arm to the back corner? The dimensions on the website give the entire width of the sofa from arm to arm. I need to know if it is going to fit on one of my walls. Can anyone tell me if they’ve fit the Ektorp sectional into a Dodge Caravan (regular sized)? Ours is a 2002 model. I am quite some distance from the closest Ikea store and am planning on going down next week to purchase this item and am starting to get cold feet! 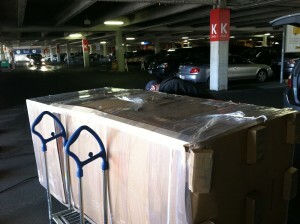 Also, do the staff at Ikea help you load your items into your vehicle as I will most likely be by myself. Thanks!